Kathy Weller awarded me this lovely tribute. It comes with a rule, however, I must reveal 7 things I love and pass on the award. If you are so inclined, play along with us! 1.) My family, of course, everyone of them from the oldest (94) to the youngest, (just one year) at least that is the youngest we are currently aware of. 2.)MAGIC... I don't care how simple the trick, I love magic and I love to keep guessing and I love to be totally stumped! 3. 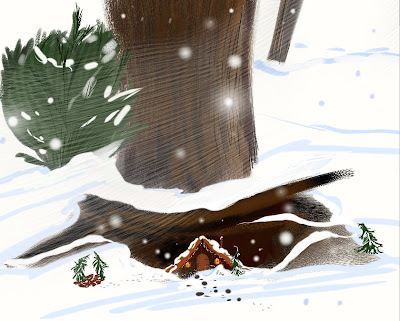 )Being an illustrator of children's books. My life long dream came true and I am living it. 4. )Chocolate...this has a place on any list I create. It often winds up on the shopping list too. 5. )Dogs...they are so loyal and loveable. I could name them all but then I would be out of blog space. 6.)Teaching. I really enjoy working with young people, little ones especially, but all age groups have a special place in my heart. 7. )Friends...without my dear friends and their support I might not find the constant joy that I do even on a bad day. 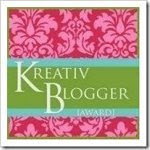 And in turn I will award this Kreativ Blogger Award to the following artist friends in the hopes that they also have time to play along. Be sure to visit their websites, you are in for a treat..... and check out my blog list of artist friends they are all AWESOME!!! I have just completed work on my first Black and White (inside) chapter book. The cover is done also, in living color, but I can't post that here. 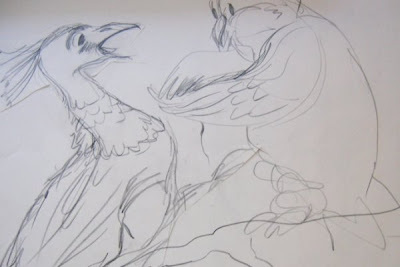 For purposes of this post, however, I wanted to share the process I followed to get from the early sketching stage to the final finishes. 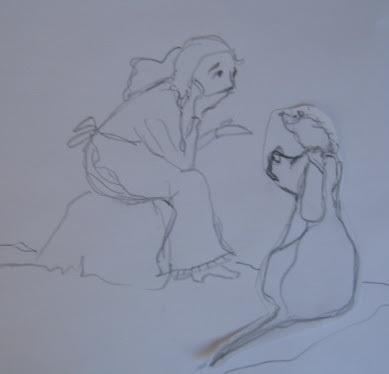 After reading the manuscript several times, (actually lots of times) I began with some character sketches. These are usually large because I like the freedom of just "letting go" and getting a good free feeling to the character. Once I had pages and pages of these done I created a story board for the entire INSIDE portion of the book. As I finished each rough I printed a tiny copy of it and pasted it into my story board. 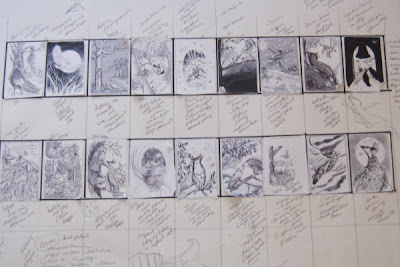 All those pencil notes on the story board are the comments from the editor/designer as we worked on composition and character and paid attention to the details in the manuscript that needed to be illustrated. 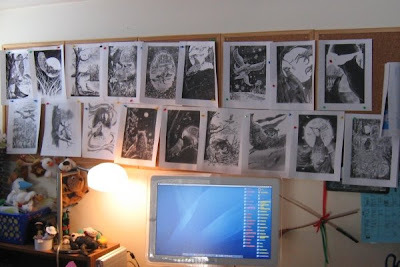 Each time I FINISHED a drawing I made a print out and posted those larger full size Black & Whites on the Bulletin Board that faces me as I work. I find that this helps to create a consistency of character and mood as I work. Style is important too. It helps me to see the particular type of line or hatching I am using as I go from one finished B&W to the next. This last photo is the bulletin board with all 18 drawings displayed. I know the story almost by heart now, and it is a beautiful one. When the book is out I will post more information and some close ups as well as the cover, ISBN and places where you can find the finished product. 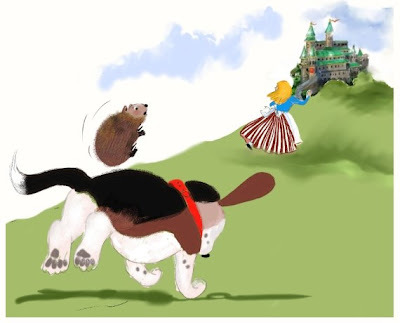 Although I am a children's book illustrator, this book seems to me to appeal to an older audience, one that moves easily into the adult range with its charm and meaningful message. 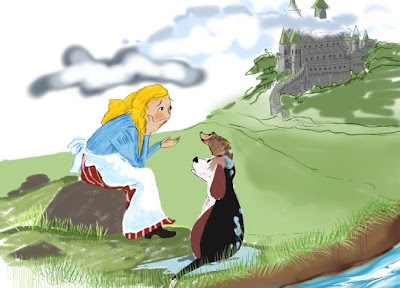 I'll be sharing more about "WHEN WISHES COME TRUE" by Barbara B Slater, in the coming months. Having reached an age where all her senses were flawed and her speed diminished, the old lioness grieved for her youth in the moonlight. On the way to the castle... a rather long walk, the cook began to retell her sad story. "I was working on the Queen's birthday dinner and had all the fine golden china ready to place on the great table in the great hall for the great dinner." Here, she stopped for a minute, shed a tear or two and then continued. " There was a sudden crash as the kitchen door was smashed in and there right in front of me was a huge creature with HUNGRY eyes and teeth as big as I have ever seen. This creature seemed not to be interested in the fine food I was preparing, but in the golden china and glittering crystal." 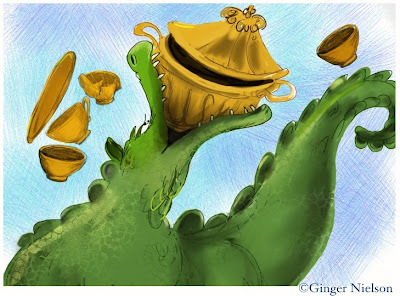 Winston and Roxxanne had stopped too, to listen and comfort the cook as she told them how the dragon had not only gobbled up all the fine china, but succeeded in swallowing the Queen's golden soup tureen WHOLE! Oh No! She's after me again. 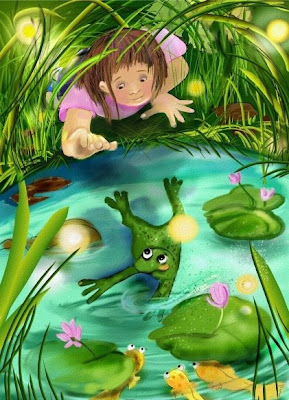 If I can just make it to that Lily Pad, and CLIMB up, I can paddle away from her. Watch out Fish! "We can help you," said Winston. "Roxanne and I have had many adventures and some close escapes. I am sure we can work something out with this dragon." "Well," the cook thought for a while, "alright, maybe, since you are both from the animal world you might be able to help me." Winston looked proud. Roxxanne looked worried. Just the same they followed the cook up to the castle. Roxxanne preferred a bumpy ride to the long walk as her little legs could only cover small amounts of ground at one time. Who knows what they will find. That is, what exactly, besides all the broken pieces of the china that didn't get eaten. Worse yet.... would THEY get eaten. 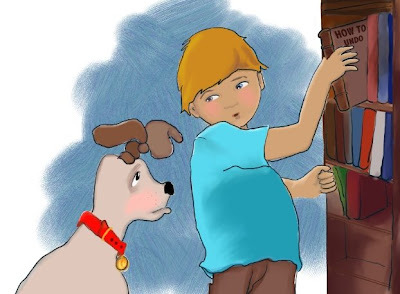 Scroll down on this blog to see previous chapters of Winston's Adventures. 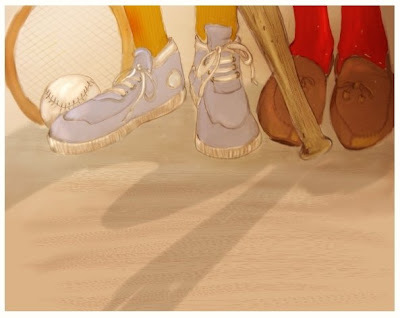 PS ~ TUNE IN FOR "WINSTON WEDNESDAYS"
Here's the beginning, and you can view a new chapter each Wednesday. And Chapter II right here. Having been Bumped right out of the moat, Winston and Roxxanne found themselves directly in front of a tearful young lady. Although they were already dripping wet, her tears threatened to keep them from drying off at all. "What is the matter?" Winston asked. "I have such a HUGE problem," replied the young lady. " A DRAGON has broken into the kitchen at the castle, where I am the cook. " "Wow!" Winston was amazed. "Is it still there?" "Y...Y... YES!" sobbed the cook. "And it is EATING all the fine china!" "Bummer." Roxxanne had to put in her two cents. "And, if I can't get all that china back before tonight the Queen will have my head!" "Oh," said Winston, " she wouldn't do that .... would she?" "She certainly would," the cook wiped her eyes with the edge of her apron, "and tonight is her birthday party. She plans to serve soup from her Royal Golden Soup Tureen." "And, I take it that was eaten too." Winston guessed. "Absolutely," replied the cook,"along with the silver ladle and all the fine crystal. What am I going to do?" ...........good question...... tune in next Wednesday. Working sketch for this segment. So.... 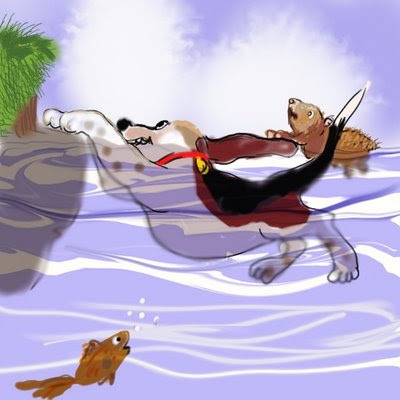 I think if I am able to keep up, I'll try to do a WINSTON WEDNESDAY and let Winston and Roxxanne continue their online adventure. I actually do know what happened to the two of them ( Winston told me all....) but you will have to check in on Wednesdays if you really want to know what happened, where they went and who they met. Well, make that who and WHAT they met. For some time I have been neglecting to post to my other blog... Winston the Wonderhound. 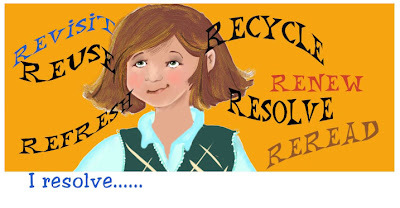 Today I was reading Kathy Weller's blog and she mentioned that she might consider merging two of her blogs. I had been thinking the same thing, and although Winston's story is a rather long and complex one, I am still considering bringing him into this blog. When simplifying seems to be the order of the day, I think it could work. 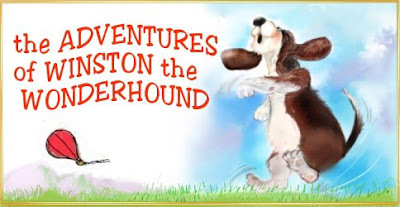 So here, I will introduce Winston the Wonderhound...and perhaps he will continue his adventures right here along with my other posts. 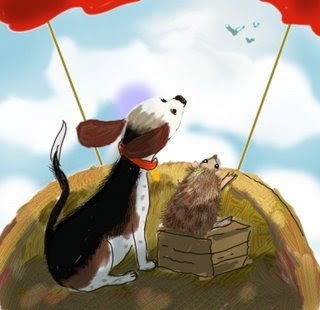 To make a long story shorter.... Winston and his hedgehog friend Roxxanne ended up floating in a balloon basket over the ocean. Presently they realized the balloon was rapidly losing air, and they were quickly dumped into the moat of a rather large castle. Struggling to climb out of the slippery slopes they were helped by some friends who were not accustomed to having dogs and hedgehogs in their way. BUMP! and Winston and Roxxanne were tossed above to dry land. And that is where I will leave our two friends for today... but tune in again soon and we can find out what was waiting to greet Winston and Roxxanne when they "landed." 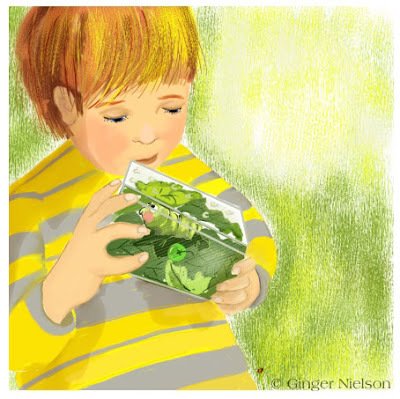 From the book I illustrated and written by Michele L. Fisher, here is Zachary with is tiny friend Cali, the caterpillar. Actually she is a tomato worm that he rescued in California and transported home to Florida in a salad on a passenger plane. 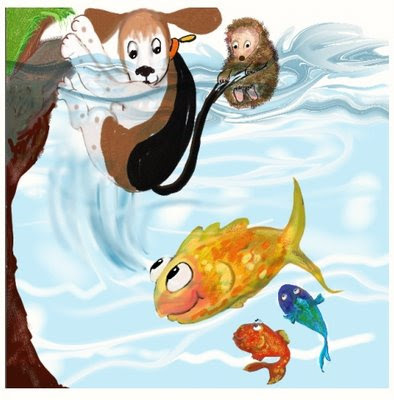 Visit Cali's own website, .The Adventures of Cali. Imagine! I wish I could distribute flyers to publishers as easily as this. 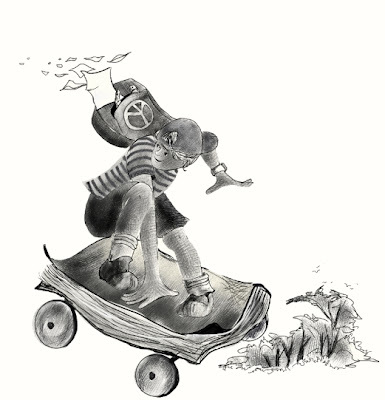 I may just use this illustration on the envelopes I will be using to send out the next package of promotional materials. There is a wonderful tree near the roadside with a strange configuration. The top seems to be divided from the bottom by a crossing of roots and stones. Under that crossway is a tiny hole in the lower portion. I always wondered if there used to be a tiny house right there. I suppose the inhabitants have since moved away and that is why it is so dark now, but I just like to imagine what it might have looked like when those tiny creatures made it their home. I sincerely hope to make my life and the lives of others better by doing what I have suggested to myself.